Commercial canopies which are virtually unbreakable - strong, long term maintenance free. 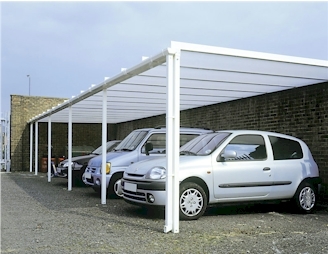 Each commercial canopy has triple wall polycarbonate sheets which carry a ten year guarantee, canopies have a rust resistant aluminium frame, our canopy-carports are versatile, simple and effective add more covered space to suit your requirements. 4.0m Projection 2.4m long Commercial canopies Canopies which are virtually unbreakable - strong, long term maintenance free, Each canopy has twin wall polycarbonate sheets, 600mm wide, available in clear, opal or bronze, which carry a ten year guarantee, canopies have a rust resistan..
4.0m Projection 3.0m long Commercial canopies Canopies which are virtually unbreakable - strong, long term maintenance free, Each canopy has twin wall polycarbonate sheets, 600mm wide, available in clear, opal or bronze, which carry a ten year guarantee, canopies have a rust..
4.0m Projection 3.6m long Commercial canopies Canopies which are virtually unbreakable - strong, long term maintenance free, Each canopy has twin wall polycarbonate sheets, 600mm wide, available in clear, opal or bronze, which carry a ten year guarantee, canopies have a rust resistant ..
4.0m Projection 4.2m long Commercial canopies Canopies which are virtually unbreakable - strong, long term maintenance free, Each canopy has twin wall polycarbonate sheets, 600mm wide, available in clear, opal or bronze, which carry a ten year guarantee, canopies have a rust resistant&..
4.0m Projection 5.4m long Commercial canopies Canopies which are virtually unbreakable - strong, long term maintenance free, Each canopy has twin wall polycarbonate sheets, 600mm wide, available in clear, opal or bronze, which carry a ten year guarantee, canopies have a rust resistant&..
4.0m Projection 6.0m wideCommercial canopies Canopies which are virtually unbreakable - strong, long term maintenance free, Each canopy has twin wall polycarbonate sheets, 600mm wide, available in clear, opal or bronze, which carry a ten year guarantee, canopies have a rust resistant ..